-Push-button assembly for arm and back. 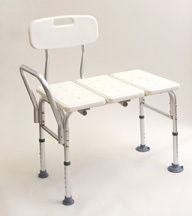 -Wide base, and suction-cup tips on two legs in tub offer extra stability and safety. -Direction of seat back can be reversed easily without tools. -Anodized, aluminum frame adjusts in 1-1/2" increments. -Fits tubs 11" to 21-1/4" deep. -1" space in seat for shower curtain.